The velvet skirt appears, yet again! Autumn is usually the only time I get to wear it, so I've been wearing it a lot. It's just so much tawny velvet, doesn't seem appropriate in any other season. Not to jump subjects too drastically, but... ELECTION DAY IS TOMORROW. Thank the Heavens, we've made it through!! Please, please, please don't let it be "too close to call". At least, even if it is, the ads will stop. Hopefully. Here in Washington, our gubernatorial race is neck-in-neck, so even if the presidential race ends with a clear winner, we might still have to suffer through months of recounts and hearings. It happened in 2008 and it definitely could happen again. How is your election season? Coming to a sweet, sweet end, I hope. A gentle reminder: I'm running a great giveaway, especially if you're need of some stylish new glasses. It's a pin-to-win, so it's a lot of fun, too! GO ENTER! You are truly Seattle fashion's "IT GIRL". 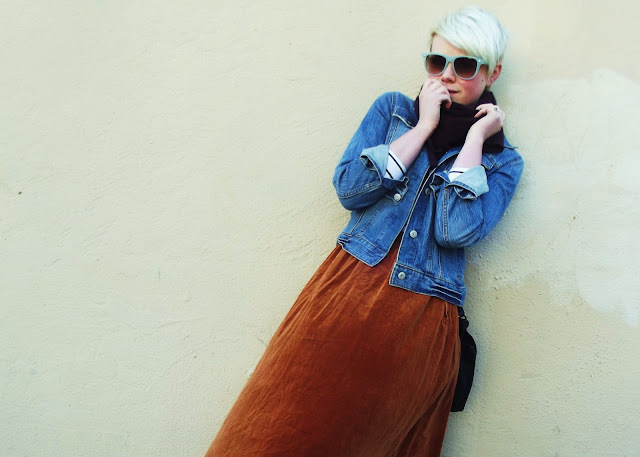 I love this effortless way you combine "tawny velvet" and sun-bleached denim. Yum. And you always have the most amazing sunglasses. How many pairs do you own?! I love this skirt so much with the striped sailor tee and the denim jacket! You are just too adorable! That skirt is a great colour on you! The mustard yellow is always a gorgeous fall colour. I just discover your blog on Chictopia and I really love it! Love your denim jacket! your skirt *-* this is really great!